Planning an Academy Award office pool, or an Oscar-watching party? Download our ballot of nominees (pdf file)! Winners of this year's Oscars will be announced on Sunday, February 22, 2015, at the Dolby Theatre at Hollywood & Highland Center in Hollywood. The show will be hosted by Neil Patrick Harris. 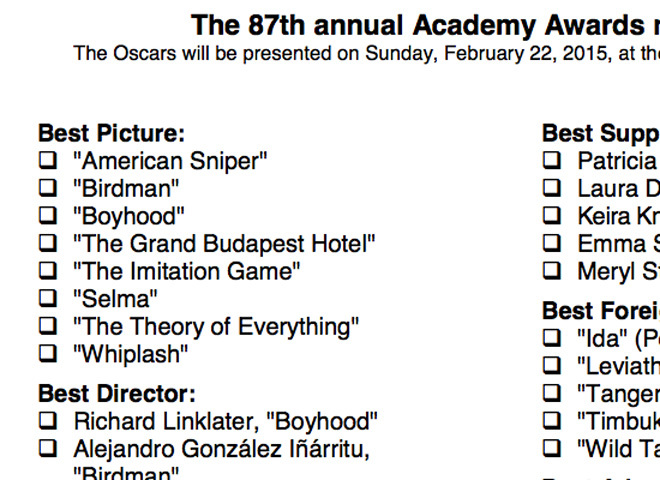 "Birdman" and "The Grand Budapest Hotel" lead the race with nine nominations each, including Best Picture. A complete list of nominees also follows below. Felicity Jones, 'The Theory of Everything"
Alejandro G. Iñárritu, Nicolás Giacobone, Alexander Dinelaris, Jr. & Armando Bo, "Birdman"
E. Max Frye and Dan Futterman, "Foxcatcher"
Robert D. Yeoman, "The Grand Budapest Hotel"
Ryszard Lenczewski and Łukasz Żal, "Ida"
Milena Canonero, "The Grand Budapest Hotel"
Colleen Atwood, "Into the Woods"
Anna B. Sheppard and Jane Clive, "Maleficent"
Bill Corso and Dennis Liddiard, "Foxcatcher"
Frances Hannon and Mark Coulier, "The Grand Budapest Hotel"
Elizabeth Yianni-Georgiou and David White, "Guardians of the Galaxy"
Joel Cox & Gary Roach, "American Sniper"
William Goldenberg, "The Imitation Game"
"Everything Is Awesome" from "The Lego Movie"